Voracious pests, termites eat any wood-based material including flooring, structural beams, and furniture. The resulting damage can be extensive and costly. In fact, termite damage to homes in the United State exceeds 5 billion dollars every year. If you’re thinking your home is not at risk, think again. 35% of single family homes in Tulsa have had a termite infestation. And it’s not just Tulsa that has this pest problem. Subterranean termites are found in every Oklahoma county and are wood-destroying insects that typically stay under the radar until damages are so bad, they’re discovered. To stop or prevent termites from infesting your home or business, Montgomery Exterminating offers effective termite control featuring the Sentricon Termite Colony Elimination System. The Sentricon System is tough on termites but not the environment. 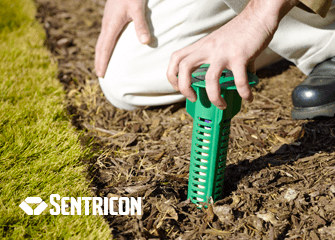 Rather than injecting chemicals into the ground, the Sentricon System relies on just a few grams of active ingredient placed inside termite stations around your structure. The result- a proven termite solution that protects even our most cherished national treasures such as the Statue of Liberty and the White House. Montgomery Exterminating is a Certified Operator of the Sentricon System and uses it exclusively to get rid of termites and to prevent termites from establishing new colonies. If you’re worried about termites, contact us today! The Sentricon System not only eliminates the termites active inside your structure, it wipes out the entire colony. How? Sentricon uses termites’ own biology to combat them in their own environment. Simply put, the bait, the system, and the science work. Take a moment to watch the video below to see exactly how the Sentricon System works. ME will inspect your structure for termite damage, signs of termites, and conducive conditions. Sentricon stations will be strategically installed in the soil around the structure to create a ring of protection. Termites will consume the bait and take it back to the colony. The end result – total colony elimination. After the installation, ME will continue to monitor bait stations for termite activity and replenish bait as needed. ME is the only company in Oklahoma to use scan stations for accurate documenting. Bundle Your Termite Control And Save! In addition to our standalone termite control service, Montgomery Exterminating offers homeowners pest control programs that include termite control and year-round protection against ants, roaches, and other common household pests! For protection against common household pests plus wood-destroying termites, this monthly program is the ideal choice. Offering all the same coverage as the Bronze home pest control plan, this one also targets termites using the highly effective and eco-friendly Sentricon Termite Colony Elimination System. *Does not include install fee. Prices may increase for homes over 2,000 square feet. 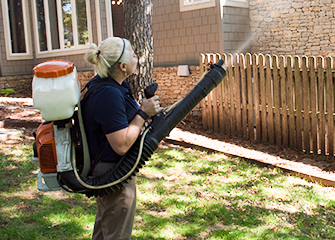 Our most comprehensive pest control and prevention package, the Gold plan not only addresses ants and other common house-infesting pests, it combats termites and targets pests that chase you indoors, like mosquitoes. The termite inspector will complete the Oklahoma Official Termite And Wood Destroying Insect Report (ODAFF-1) as part of the service. Contact us today to learn more or to schedule your inspection!